caregivers can improve their own peace of mind. If you are a caregiver to someone with incontinence, limited mobility, or any of the myriad of other conditions that often face seniors, consider the following five tips for increasing comfort, health, and safety for your loved one while also improving your own peace of mind. Provide lighting: Night lights and illumination can help to reduce trips and falls when seniors get out of bed. Keep the senior in bed: Providing sufficient absorbent wear for night, entertainment, and anything the senior may need near the bed can help them get in bed, and stay in bed, at night. Remove tripping hazards: When seniors get out of bed at night it is often to use the bathroom or go to the kitchen. Keeping these walkways clear of rugs, furniture, and other things will improve safety. Helps seniors stay in place in their own homes. Provides a means for getting help, even at night. Gives caregivers peace of mind. 3. Choose the right incontinence products: Millions of Americans suffer from incontinence, and there are hundreds of products available. It is important to choose products that best fit your loved ones needs. The right products will help increase health and happiness, give the individual more confidence, and provide better skin health. Consider size, style, fit, and absorbency when choosing incontinence products. Try before you buy in bulk by ordering samples. 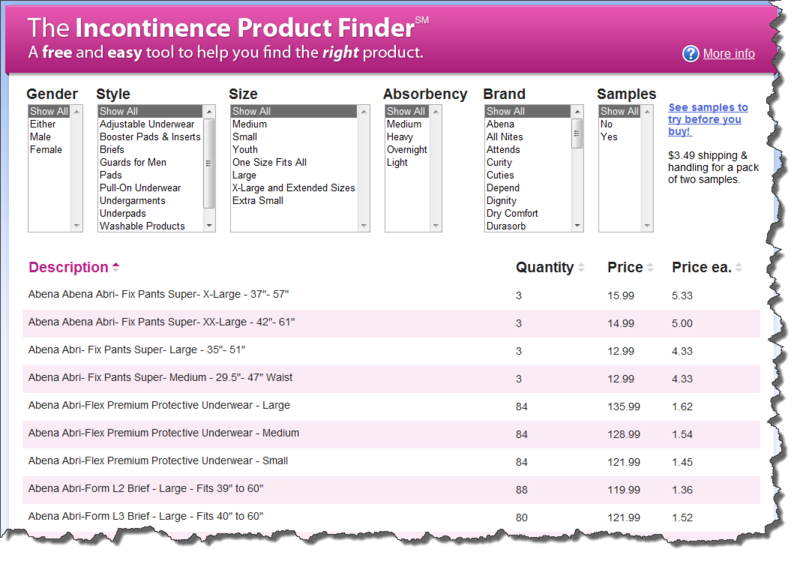 Use this handy Incontinence Product Finder to make sorting through the hundreds of options easier than ever. Consult with a product specialist to help you feel confident in your choice. Call 800-985-1353 M-F 9-4 CST to talk to one of our product specialists. 4. Use a meal delivery service: Many seniors suffer from malnutrition. Finances, mobility, and other factors may make it difficult for seniors to get the food they need. Medications, illness, etc. may suppress appetite or make food less appealing. Specialized dietary needs may make it difficult for the senior to prepare the foods that are right for their body. Using a meal delivery service like Mom’s Meals can help reduce risks of malnutrition, which means greater health and longevity, as well as greater quality of life for your senior loved one. 5. Consider a Senior Care Auditor: If you are using paid care, whether in-home or at a facility, it is important to realize that sometimes you may not be getting the care your loved one deserves or that you are paying for. An auditor will assess the care and situation and identify and alert you of any problems. Call 1-800-627-2313, and mention The CareGiver Partnership. You can save $75 off the initial set up fee of $150. By doing these five things you can feel confident that your loved one is getting the care they need, and protection they deserve, and you get peace of mind, whether you can be there all the time, or just now and then.